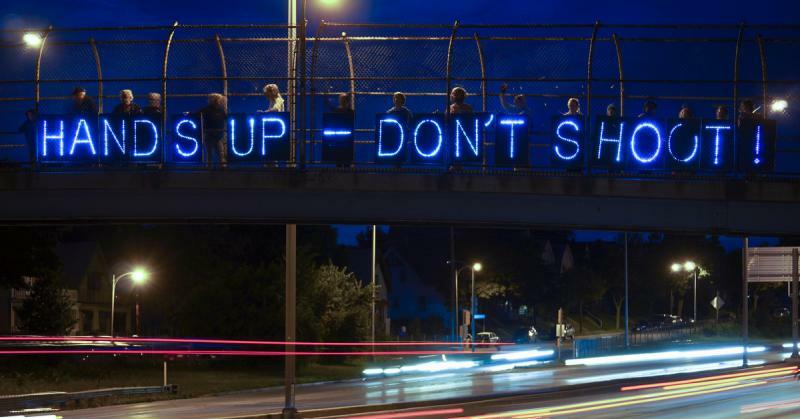 Protestors hold signs in solidarity with Ferguson, MO shooting victim Michael Brown. "We thought that we had to have credibility with the citizens of Dallas County. … There needs to be an independent review of police officers' shootings. Traditionally police officers investigate themselves and we thought to regain the public’s trust that there needed to be an independent investigation." "We just have our finger on the pulse of what the public sees and how they feel about law enforcement. Unfortunately, for some communities there is no trust with the police department. That causes police officers to be in danger and causes citizens to be in danger because there is no trust. So in order for us to move forward we need to regain that trust. … I think it’s the greatest responsibility we have in law enforcement issues is to keep the public’s trust – because when we lose that, we have anarchy." "There is a level of mistrust here. I think there is a level of mistrust with police departments throughout the country. I’m an African-American and obviously I have issues with policing because I’ve seen the ugly side of it – and there are a lot of folks like me. Fortunately for me I’m the district attorney of Dallas County, and I can control policy and change policy. In order to make things better, I bring my experience to the table, which tells me for this to work – in order for us to be a better Dallas County, a better country – we need to address these issues." "We’ve actually had something similar to that here in Dallas. …There was semi-rioting because a person was shot by a police officer. However that shooting was [found by a grand jury to be] justified. But the reality is, when there is a justified shooting and you have a segment of society who has a mentality that police are not there to protect them, then you will get people who just don’t believe when there was a justified shooting. So in order to regain that belief, there needs to be an independent agency that will look at these shootings and make a determination to regain the public’s trust."